Business owners want – and need – to answer questions about their business quickly, accurately and easily. Aberdeen’s March 2011 report, “Agile BI: Three Steps to Analytic Heaven” detailed the need to provide self-service business intelligence tools to accomplish this goal. 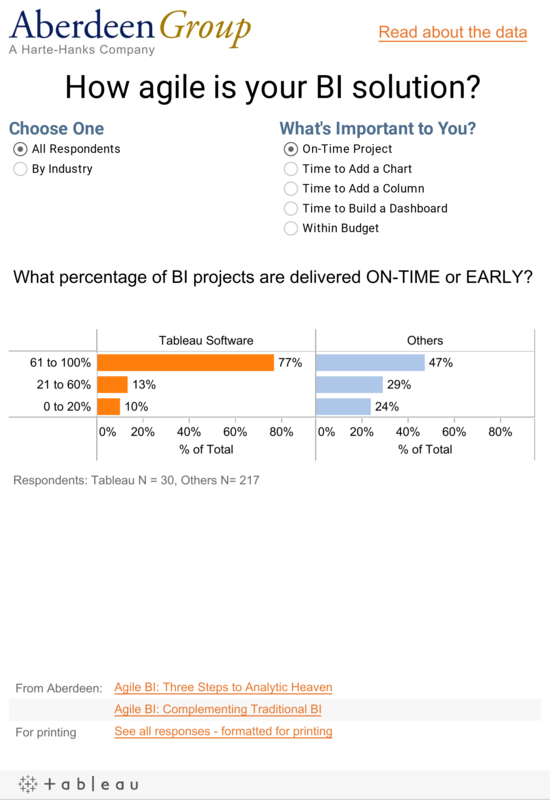 Why is self-service, agile BI critical? It helps business users get the information they need when they need it and it alleviates the backlog of report and dashboard requests facing IT. Read this Analyst Insight paper by Aberdeen to learn more about how the Tableau customers represented in “Agile BI: Three Steps to Analytic Heaven” view their self-service, agile BI deployments. Why seventy-six percent (76%) of Tableau customers indicate that enabling a self-service business intelligence platform is a top strategy to be more responsive to business needs. How Irish Life, one of the largest insurance providers in Ireland, is adopting a self-service BI corporate strategy with Tableau. What could the impact of visual/interactive BI be for your organization? Investigate the survey results for yourself in this interactive Tableau dashboard. Use the buttons at the top to select overall or industry responses and switch between different survey questions. Business Intelligence (BI) solutions aim to provide organizations with timely access to actionable data to aid decision making. Traditional BI solutions have often provided business managers with relatively static views of data, with limited ability for manipulation and analysis. Unfortunately, this frequently leads to the corporate IT organization being inundated with requests for different views of the data. March 2011 Aberdeen research (Agile BI: Three Steps to Analytic Heaven) found that many organizations are pursuing a more agile business intelligence solution that allows these new views of the data to be provided rapidly - often by the business users themselves in a self-service fashion. In total, 344 organizations took part in Aberdeen's survey on agile business intelligence, with 49 of those organizations using Tableau Software as their primary BI solution. This Analyst Insight compares the performance of those 49 Tableau customers to customer of other BI solutions. Customers of Tableau perform very well - even when compared to the top performing 20% of all survey respondents, the Best-in-Class. Aberdeen's research into agile BI found that the most common strategy for pursuing agility is to adopt a self-service BI model. With this approach to BI, business users are very strongly encouraged to proactively analyze and manipulate data directly themselves, whenever necessary. That is, whenever the reports, charts or dashboards provided by corporate IT do not provide the information the user requires, the user should be able to manipulate the data and data presentation directly to find exactly what they need. There are two benefits to this approach. First of all, the business user gets the information they need sooner, allowing more responsive and timely decision making. Secondly, corporate IT is no longer on the hook to conjure up myriad different views and perspectives of the same basic data. Seventy-six percent (76%) of Tableau customers indicated that enabling self-service is their top strategy for creating a BI solution that is more responsive to business needs. The survey data in Table 1 shows that Tableau customers are well on their way to achieving this objective. Tableau customers are performing well above the Industry Average segment, and above or on par with the Best-in-Class (top performing 20%) from Aberdeen's agile BI survey. Specifically, half of the BI users at Tableau customers are able to use BI in a self-service capacity, compared to 42% of BI users that are able to do so at Best-in-Class organizations. More users can access BI and get the information that they need with no or limited assistance from IT support. This puts management information at the fingertips of the people that really need it - business managers. This is clearly an acceptable solution - 50% of Tableau users use the BI solution at least once a week. Users are fickle. If they do not find software valuable, they simply won’t use it. The relatively high weekly usage shown by Tableau customers indicates that users are comfortable using the solution and find it provides information that helps them to run the business. This increased rate of usage makes it likely that more employees understand the metrics that are most important to the business and are more able to make timely decisions. This in turn leads towards increased risk mitigation and the ability to take advantage of opportunities as they arise. By having instant and constant access to information, employees are more informed and better able to lead the business. Of course, having access to information is useless if it is not accessible in the time required to make a vital business decision. For example, raw point-of sales data may indicate that an important retailer will be out of stock in two days time. However, if it takes a week to aggregate that data and make that information available to the manager who can take corrective action, then clearly the information arrives too late to have value. On average, Tableau users are able to get the information they need in the time required 83% of the time. While not performing quite as well as the Best-in-Class (85%) these customers are still performing well above the Industry Average. This is evidence of the agility and flexibility enabled by a powerful self-service BI solution. During normal business operations, unexpected events occur that need a rapid response - either to head-off a problem or to take advantage of an emerging opportunity. Traditional BI solutions can struggle here, as business managers try to get answers to questions that were never anticipated during the initial development of the solution. A self-service approach - where managers are willing and able to explore data to find those answers themselves - can enable a much more rapid response and lead to business advantage.